It was yet another spectacular Sunday morning for our yearly lakeside rendezvous. President Shakalis reported that the Association’s long-running legal tussle with a disgruntled non-resident has ended in success. Dr. Bodley’s State-of-the-Lake message was that (1) the fish population in the lake is the best since 2001, and (2) the impending chemical treatment of invasive underwater weeds -- authorized by the Town of Barnstable -- will likely upset the ecological balance in which said fish are thriving. Need copies of what was handed out at the meeting? Here are Bill Masterson’s 2013-2014 Treasurer’s Report and the 2013 Annual Meeting’s Minutes as presented by Chris Shakalis. Once again, we had a sparkling Sunday morning for our yearly powwow, this one featuring a demonstration from Professor Bodley of proper removal and sifting of beach debris! In case you missed the event, here are Bill Masterson’s 2012-2013 Treasurer’s Report and the 2012 Annual Meeting’s Minutes as presented by Chris Shakalis. 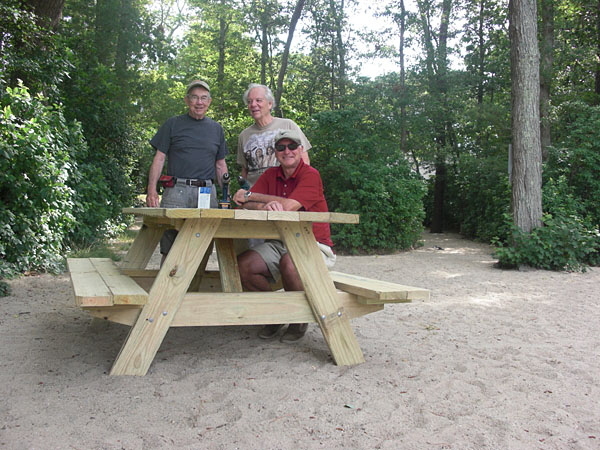 We may be down one tree, but our beach has added a new picnic table! Built by Roger and Mike Bodley (of wood from some other tree) and ably hauled into position by Frank, Roger, George & Rick, the table seats four comfortably. 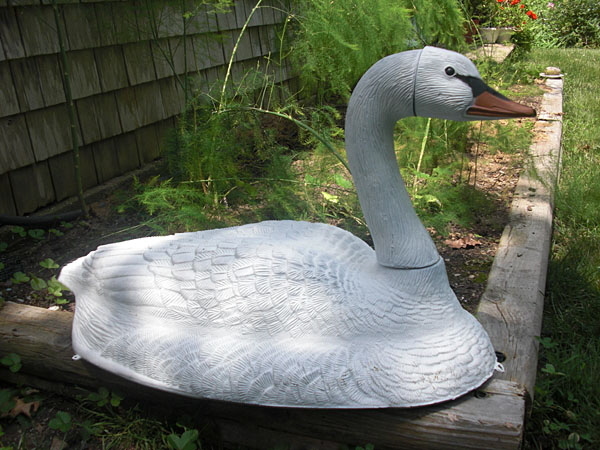 Decoy swan poised to terrorize would-be poopers! Keeping the lake’s E.Coli numbers low is a proud tradition of the Holly Point Association. Now we’ve enlisted a new volunteer (well, a drone, actually) into the battle: a wingless, flightless, legless plastic swan, determined to deter fellow fowl from fouling our water with their poo. 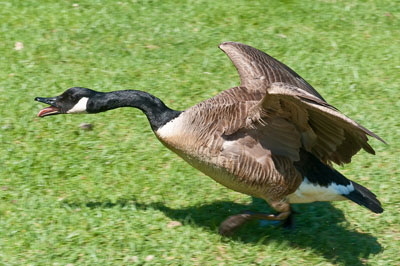 Our faux-feathered friend recently completed his long flight from China and will soon be deployed to make defecating less pleasant for floating-dock strafers from Canada. Besides refreshments and Roger Bodley’s always-informative Beach Report, attendees received copies of the 2011 Annual Meeting’s Minutes and the 2011-12 Treasurer’s Report. If you’ve got news that’s relevant to the membership, let’s get it on the website! Email your info to news@HollyPointAssociation.org -- and please include your phone number, in case we have a question.